The Island IIIB is a new wood-burning boiler stove from Charnwood. Based on the Island III stove, the Island IIIB combines leading-edge boiler technology with an aesthetic design. As an integral boiler stove it is optimised to heat water, thus ensuring exceptional performance compared to add-in boilers which reduce the efficiency of the dry stove. • Integral boiler with an output suitable for heating domestic hot water and approximately 10 radiators. • Thermostatic control which is water temperature sensitive, enabling this model to be used with sophisticated central heating controls. 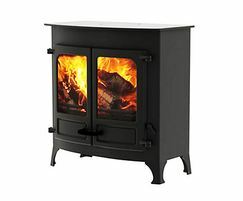 • Option of the Charnwood pre-wired central heating control system for use with this stove. • Cleanburn airwash system using preheated air for combustion purposes which ensures clean glass and reduced emissions. • Charnwood riddling grate to allow easy removal of ash. The grate can also be opened slightly to increase burning rate when required. • A cool to touch handle. • Large firebox with the ability to burn up to 550mm logs. • Sweep the chimney through the stove with the drop-down throat plate. • Wooden handled multi-functional tool for riddling and ash disposal included. • Boiler firebox has a 3-year parts guarantee.